One of Australia’s most controversial political and business figures, Queenslander Clive Palmer, has had his key company Mineralogy take up two North Island mineral leases. This comes at a time when the minerals sector in NZ is backpedalling largely due to the negativity of the Ardern Government. While Mineralogy’s arrival may be seen as a godsend by industry observers, the full agenda may have little to do with the complete list of minerals on the Waikato permit applications 60512-01 (Waimai) and 60513-01 (Kawhia). The Australian newspaper, the West Australian and other Australian media have been citing threats from Mineralogy including a report that its chief Chitondo Mashayanyuka wrote to the WA Premier Mark McGowan as a now NZ holding company to threaten procedures in Australia’s free trade deal with NZ. The issue, according to Mineralogy, was that the State should not intervene in a dispute between Mineralogy and Chinese company CITIC which is mining iron ore in the Pilbara on ground in which Palmer is a vendor. The figure of $A45 billion was mentioned in the reported threat. Political writer for the West, Nick Evans, said this week that documents relating to the free trade deals with NZ on Australia’s Foreign Affairs website suggest Palmer would be banned from launching such an action. What must be puzzling many Australians is that Palmer has rebadged his political campaign from the short-lived Palmer United Party that saw him win a House of Representatives seat and joined by senators from Queensland, Tasmania and Western Australia and an affiliation from a motoring party senator. But in less than a year the Tasmanian and Queenslander fell out with Palmer and he saw his electoral popularity wane enough for him not to seek re-election after Malcolm Turnbull’s unwise new election that wiped out most of the Liberal-National Party majority and saw the surviving PUP support wiped out. Columnist and former editor of the West Australian, Paul Murray wrote an article which graphically portrays Palmer as a court jester. The column said One Nation’s Pauline Hanson and Labor leader Bill Shorten appear to have discovered unusual common ground as they race towards the imminent Federal election. Both have found the need to give Clive Palmer a good kicking over the treatment of 800 workers at his shuttered Queensland Nickel refinery north of Townsville. “It is a sobering part of our political history that Palmer attracted 157,740 voters in WA’s special 2014 Senate election, some 12.34% of the poll, following a massive advertising blitz,” Murray wrote. Paul Murray said ever since he won a $200 million court action against his Chinese partners in the Sino Iron project in late 2017, Palmer has flooded Australia with political messages, at first on billboards, then with cable TV advertising and most lately through unsolicited mobile phone texts. “One of the unnerving elements of the Palmer saga is the perception that money spent on relentless advertising can buy some people’s votes. The other is that many people are so disaffected by the political system that they either don’t care who they vote for or they just want to cause the maximum disruption through their choices. “Palmer’s behaviour over the recent texting controversy not only questions his sanity, but certainly that of anyone who might still take an interest in what he says,” he added. Murray said Palmer’s new United Australia Party’s sole parliamentary representative is One Nation quisling Brian Burston who holds a NSW senate seat. He said Palmer runs his new political organisation on a Put Australia First slogan, but has moved the ultimate holding company for his WA-based Mineralogy assets to NZ. Other media groups have said how could Palmer be putting Australia first when he is threatening to take billions of taxpayers’ money. “Sadly, the detail is probably lost on the sort of voters attracted to Palmer who see no contradiction with his Trumpesque rhetoric,” commented Murray. This writer and NZResources business partner Carl Knox-Robinson devoted a chapter to Clive Palmer in the book “Australia’s Nickel Adventure” (advertised on this site). 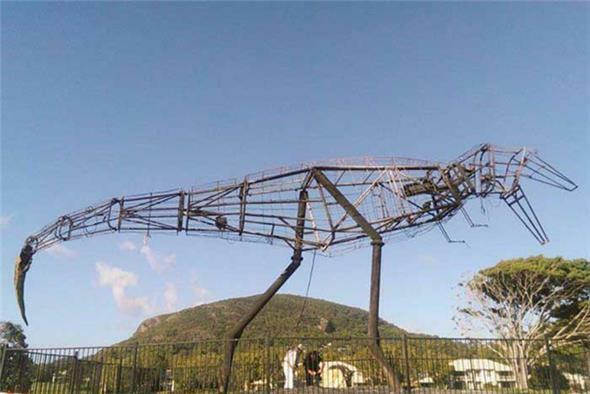 The chapter headed: “Jeff the Dinosaur was just one of Palmer’s Waterloos” refers to Palmer’s reshaping of a resort at Coolum, a Sunshine Coast golf course where he created a dinosaur park that didn’t inspire visitors. Then his flagship Tyrannosaurus Rex, called Jeff, caught fire and became a shell and a feature story for the media. Also lapsing into the background has been Palmer’s vision to build a new Titanic. The book chapter’s main point was to detail the sad end of the Yabulu nickel-cobalt refinery near Townsville that Palmer bought from BHP prior to a nickel price surge. The immediate good times saw Palmer lavish 55 Mercedes Benz at a cost of $A10 M on some staff and he gave impressive holiday trips to others. But when the music stopped about two years later with nickel slipping into the basement, the refinery was not in Palmer’s claimed control and was run by a nephew who said everything would be fine and then disappeared overseas. Court efforts to get nephew Clive Messink to appear on what was now a multi-million dollar disaster – a closed ageing refinery and no funds to pay for the retrenchment of hundreds of workers, and to pay service companies. Clive Palmer continued to tell the media Yabulu was not his responsibility, yet court evidence showed one of his aids was paying money to keep Messink going, and at one stage he was found by an Australian journalist in Bulgaria. So, New Zealand do you have a new mining warrior, a court jester or something in between? 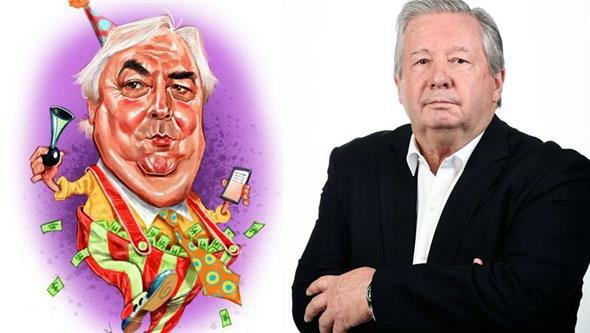 West Australian columnist Paul Murray and his newspaper’s caricature of Clive Palmer. Source: The West Australian. A charred Jeff the dinosaur at the Coolum resort.